With her internationally bestselling novels Chocolat, Blackberry Wine, Five Quarters of the Orange, and Coastliners, Joanne Harris has woven intoxicating spells that celebrate the sensuous while exposing the passion, secrets, and folly beneath the surface of rustic village life. 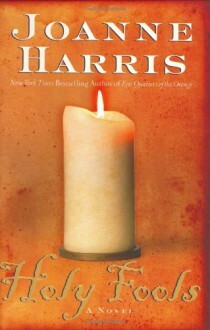 In Holy Fools, her most ambitious and accomplished novel to date, she transports us back to a time of intrigue and turmoil, of deception and masquerade.In the year 1605, a young widow, pregnant and alone, seeks sanctuary at the small Abbey of Sainte Marie-de-la-mer on the island of Noirs Moustiers off the Brittany coast. After the birth of her daughter, she takes up the veil, and a new name, Soeur Auguste. But the peace she has found in re-mote isolation is shattered five years later by the events that follow the death of her kind benefactress, the Reverend Mother.When a new abbess -- the daughter of a corrupt noble family elevated by the murder of King Henri IV -- arrives at Sainte Marie-de-la-mer, she does not arrive alone. With her is her personal confessor and spiritual guide, Père Colombin, a man Soeur Auguste knows all too well. For the newcomer is Guy LeMerle, a charlatan and seducer now masquerading as a priest, and the one man she fears more than any other.Soeur Auguste has a secret. Once she was l'Ailée, "The Winged One," star performer of a troupe led by LeMerle, before betrayal forced her to change her identity. But now the past has found her. Before long, thanks to LeMerle, suspicion and debauchery are breeding like a plague within the convent's walls -- fueled by dark rumors of witchcraft, part of the false priest's brilliantly orchestrated scheme of revenge. To protect herself and her beloved child, l'Ailée will have to perform one last act of dazzling daring more audacious than any she has previously attempted. Depois de ter lido já um livro da autora, pensei que ia ficar tão ou mais surpreendida com outro livro dela. Apesar de ser um tema que me interessa e que foi bem exposto, não fiquei deslumbrada.